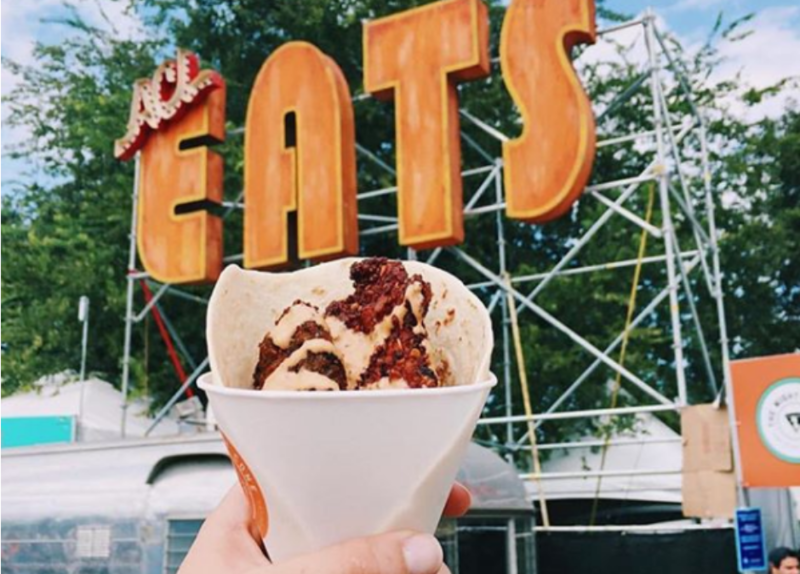 ACL fest has food that will please every festival-goer! Choose from tacos, barbecue, ice cream and more! There’s something for everyone in the ACL fest food courts! It wouldn’t be an Austin festival without tacos right? Check out some of the tasty tacos being served up in Zilker! As flavorful as it is colorful…. please enjoy our Breakfast Special of the Moment, “My Morning Taco”! Many Austinites consider the Tacodeli breakfast taco to be the best in town! Find out for yourself at ACL fest! Vegetarian tacos are available. The Peached Tortilla brings Asian and Tex-Mex cuisine together in an marriage of deliciousness! Vegetarian options like the Cauliflower taco means everyone can have a happy tummy! Torchy’s is another Austin favorite, known for their overstuffed, decadent tacos. They’ll have vegetarian options at the ACL fest food court. Answer the age-old question for yourself: is the official Austin food tacos or barbecue? Micklethwait will be bringing their Texas Monthly Top 50 Barbecue right to your tastebuds at ACL fest! Skip the drive to Driftwood and slip into a meat coma right here in Zilker Park! Grab some extra napkins because their sauce is heavenly! Don’t worry, ACL Fest will have healthy food choices too! Blenders and Bowls is famous for their Acai bowls. This superfood tastes like a cross between a blackberry and a piece of dark chocolate! Enjoy a juice or smoothie and load up on nutrients through your straw! At ACL fest, this might be the most convenient way to enjoy a snack. This week's special is the Crunchy Peanut Butter Cup Banana! Let's sing the song together! 🎶Crunchy Peanut Butter Cup! Crunchy Peanut Butter Cup! It's crunchyyyyyy!🎶 It's dipped in peanut butter, then topped with peanuts and a heavy coating of chocolate! For all your Crunchy Peanut Butter Cup needs! Cool down with a frozen, chocolate-covered banana! Vegan and gluten-free options available. This beloved Austin institution will be serving up their delicious creamy frozen delights at ACL fest! Gluten-free and vegan options will be offered. What better way to survive ACL fest’s crazy heat than with a sno-cone? Plus, their soft, fluffy ice and homemade sugar cane syrups are gluten-free and vegan! Ready to make the leap from festival-goer to Austinite? Even if you’re a new renter, our expert apartment locators make the process simple! YES! Find Me My New Home in Austin!